Group pickup from the Gdańsk airport. Transfer to Elbląg, Hotel 4 *, relax in the SPA(swimming pool, Jacuzzi, sauna, steam bath), dinner buffet. Welcome party game with mechanical music and night. After breakfast-buffet . 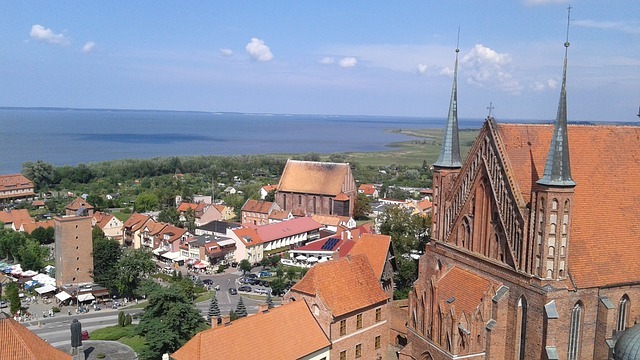 Trip to Ostróda and sightseeing of the city. A walk along the promenade, sightseeing from the outside of the Teutonic Castle. Then drive to Olsztynek to visit the Folk Architecture Open-air Museum. Then a visit to Olsztyn. Visiting The Warmia and Mazury Museum in the Castle from XIV century (Gothic style) where Nicolaus Copernicus worked, a short tour of the city and transfer to a regional restaurant for a folklore evening including dinner.. Return to the hotel in Elbląg for night. Breakfast -buffet Trip to Malbork to visit the Castle Museum. A Gothic castle in Malbork built by the Teutonic Knights -XIII-XV centuries (the biggest in Europe medieval castle built with bricks). Transfer to Krynica Morska – a well known tourist resort with beautiful sandy beaches on the Vistula Split – swimming in the Baltic Sea, visiting a Lighthouse with beautiful panorama to the Baltic sea and the Vistula Bay. A ship tour to Tolkmicko and return by bus to the hotel in Elbląg, dinner buffet and night. Breakfast buffet , drive to Krutynia. There will start a boat ride, kayaks on a very picturesque and clean river of the same name. In Krutynia, you can taste fish dishes from Masurian lakes (additionally paid ca 15 EUR). After this meal we continue to explore the northern part of Masuria. At the beginning Wilczy Szaniec near Kętrzyn with Hitler’s former headquarters to East Prussia, and then a tour to the church in Św. Lipka (St. Mary’s Sanctuary of XVIII century -hearing a short organ concert). Return to the hotel in Elbląg,dinner buffet and overnight. Breakfast buffet Drive on a cruise on the Elbląg Canal, on the route Buczyniec – Elbląg. Sailing through the canal, the ship overcomes a height difference of more than 100 m using the 5 slipways and a special trolley, which is transported. Then we will flow into Lake Drużno, a reserve of fauna and flora, where there are about 200 species of birds nesting. The only active, such a hydrotechnical facility on a global scale. Transfer to Pasłęk – where are the Teutonic Knights Castle is placed from XIV century, aTown Hall from XIV/XV century. You will taste locally made ice creams. Return to the hotel in Elbląg. Dinner buffet with recreation in the outdoors ( pedalo, canoes, mini zoo …) , party game with mechanical music – a farewell evening. Return to the hotel in Elbląg , night. Breakfast buffet. Transfer to Gdańsk. Sightseeing Westerplatte (a place of the outbreak of the World War II); visiting the Gdańsk Shipyard (the center of the birth of the Solidarity movement), Monument to the Fallen Shipyard Workers; the Old Town in Gdańsk. Artus Court, the Town Hall, Stary Żuraw. Transfer to Gdynia – a visit to the „Dar Pomorza” -sailing ship. Ttransfer to Sopot – visiting the promenade and the longest in Europe wooden pier. Return to the hotel in Elbląg, dinner buffet and night. Breakfast buffet and transfer to airport ( departure). BENEFITS: Transfers by bus (WC,DVD, air conditioning ), a Guide (English language), Accommodation in the Hotel 4 * & Spa, (2 persons room) SPA- no limits (swimming pool, Jacuzzi, sauna, steam bath)two Meals according to the offer ( breakfast buffet and dinner buffet: soup, three main courses, three extras, two desserts, mineral water on the tables)Admission tickets,1x Welcome party,1x Farewell party,1 x Dinner with folklore .